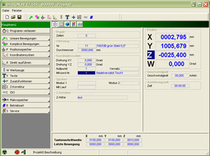 A highly efficient operation of the dispensing system is done through a Windows-based menu interface. It offers convenient functions for set-up, fast programming, e. g. in Teach-In-Mode, and rapid download of 3D CNC files of any size. For a quick data exchange the machine is equipped with a USB 2.0 and a 100 MBit network connection, as well as a CAD/CAM interface. The dispensing program iVD-AV was developed by DATRON, and is customised for DATRON dispensing machines. It corresponds to the machine software and is used for programming contours on a separate workplace. With this dispensing programms can be created apart from the machine and be transmitted via network interface directly to the machine. The programme has a text-based user interface with optimally cascaded menu guidance. This makes programming intuitive and easy to learn. At the same time, a series of additional functions is available, which will effectively support you in programming. To preview the dispensing contour, a graphical simulation programme is available, which can display the contour in many different ways. Only with a fast CAD/CAM data transfer and an easy-to use machine software you save time. DATRON machining solutions offer a practice-oriented machine software, a fast and easy-to-use CAD/CAM software and interfaces to all standard 2D and 3D CAD programms. PrimCAM is an easy-to-learn CAD/CAM system. A user-friendly interface with graphical symbols makes it possible to quickly access a multitude of functions. These functions can be used to create a drawing of a dispensing contour, even without previous programming skills. All dispensing-specific parameters, such as the dispensing height, bead thickness, and Start and Stop cycles, are directly input into PrimCam. 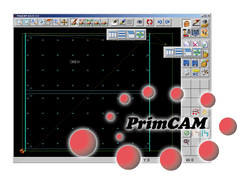 In addition, PrimCam contains an installed CAD part, with geometry creation with dimensioning options. There is a graphical simulation tool available for trouble-shooting, and it can also be used to make data contours and traversal paths visible. Dispensing times can be estimated and machine times can be planned.